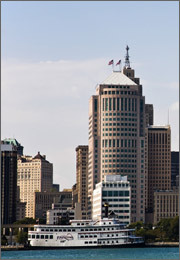 Detroit is Michigan’s most populous city, with around 5 million inhabitants residing in its greater metropolitan area. Besides its frigid winters, Detroit is famous for its automobile industry. In fact, “Cadillac” was named after the French founder of the city. Detroit came to be known as “Motor Town,” or simply, “Motown.” The “Motown sound” dominated the radio airways of the 1960s, with artists such as the Jackson Five, Stevie Wonder, The Four Tops, The Temptations, Marvin Gaye, and Smokey Robinson. Detroit’s huge auto industry has formed its economic backbone, enabling Detroit to become a truly global city, with numerous large downtown law firms and over 10,000 practicing lawyers. With this great multitude of Detroit lawyers to select from, how can one find an honest and capable lawyer interested in one’s problem? LegalMatch.com matches people grappling with a legal problem to the Detroit lawyer who will most benefit their case. This unique service is free of charge to clients. Simply explain your problem, and a pre-screened Detroit lawyer will be happy to confer with you. Detroit lawyers practice in multifarious legal areas, including divorce law, criminal law, personal injury law, bankruptcy law, real estate law, and more. Several Detroit bankruptcy attorneys have been involved in assisting the representatives of retiree groups and labor unions file challenges to the city of Detroit’s petition for bankruptcy. Although Detroit’s bankruptcy petition has been approved by the 6th Circuit United States Court of Appeals, the labor unions and retiree groups intend to appeal the approval. Detroit lawyers spend a lot of time at the 36th District Court. Competent Detroit lawyers will memorize the various court rules of different departments including traffic, small claims, real estate, criminal, probation, and appeals. Alternatively, you may not be ready to sit down with a Detroit, Michigan lawyer at this time. If your lawsuit is in its beginning stages, you can comb through the useful information in LegalMatch’s extensive Law Library, which contains over 3000 articles. Or present your questions free of charge at LegalMatch’s Consumer-Lawyer Forum.